My love for beetroot is very recent. I always knew beet is healthy and nutritious, but I never ate it willingly, until recently. I had this beetroot salad at my friend’s place and loved it so much that I bought a bunch of beetroots the very same week and tried the recipe. And there was no looking back with beets. Now, I count them amongst my favorite foods. The good this is it takes mere minutes to make. I have also included some of the amazing health benefits of beetroot, to pique your interest in this earthy, sweet flavour vegetable. Beetroot is one of the best vegetables for the liver as it aids digestion and improves liver function. And if you look after your liver, your skin literally glows with health. Besides, a sluggish liver is bad for your hair too. According to ayurveda liver problems can halt hair growth. Beets are rich in antioxidants and phytonutrients, which assist in the elimination of toxins. If you want to give your body a light detox, beets are a food that belong in your diet. The phytonutrients present in the beet also support our brain health, as well as eye health. 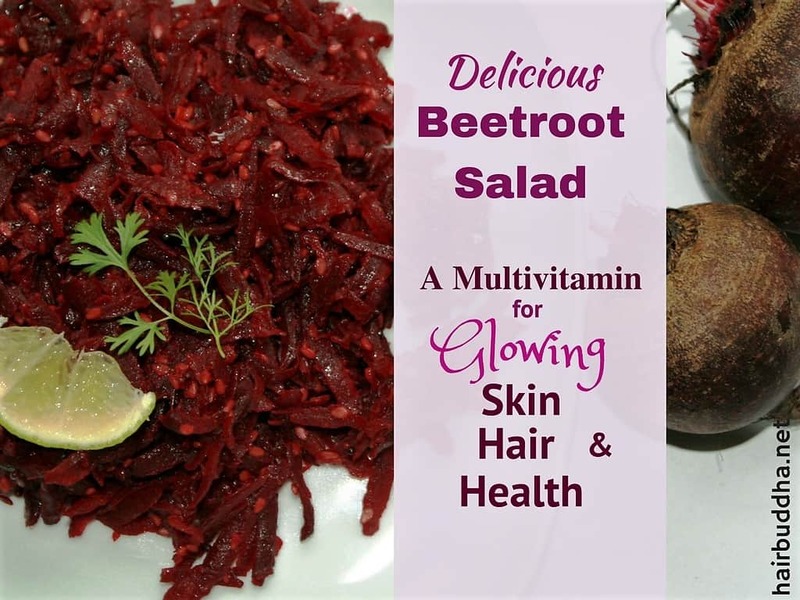 Beets are a good source of iron, copper and folate – all these are vital for healthy hair. High in beneficial fiber, beet lubricate the intestines and is recommended for constipation. In traditional Indian medicine, beet is said to be a good blood tonic and blood builder. 1. Heat oil in a pan (heat on medium). 2. Add mustard seeds, cumin seeds and red chilli (I break it into 2 or 3 pieces to extract more flavour), and let them sizzle for 15 t0 30 seconds. 3. Add the sesame seeds and stir for a few seconds. 4. Now add the peeled and grated beetroot and salt; mix in well. Serve warm or cold as a starter or as a lovely little extra alongside mains. You can also use it in wraps and sandwiches. Carrot particularly goes well with this salad. You can add grated carrot along with beetroot to make it more flavorful. You can try using other seeds or nuts such as sunflower, pumpkin, peanuts, and pine nuts. I like the light feeling and high energy I have after eating this energizing, cleansing salad. I’m sure you will like it too! Look at vegetable market for fresh, or health food stores/online for dried sage. My beetroot salad – Cut cucumber onion tomato into thin round slices. ingredients give out their juices and gives a very fresh pure taste…..
Great recipe. I am giving it a go this weekend.